Against Flow by Lana Polansky. What do they have in common? Pointing out something they think is taken for granted in discussions about games. And I think sometimes people who read these are too quick to get into a mentality of “Either A is the Right Way or it’s the Wrong Way.” I try to read these things more in frames of “Here’s something you might find useful.” Now Bogost’s article went a little further into, “This is the superior one-and-only true framework.” But I don’t need the author’s permission to interpret it in the way that I find useful. Good game design happens when you view your game from as many perspectives as possible. I refer to these perspectives as lenses, because each one is a way of viewing your design. … None of the lenses are perfect, and none are complete, but each is useful in one context or another, for each gives a unique perspective on your design. In Jesse’s book, Flow is just one lens of many. It is useful in one context or another. If it gets to be too unchallenged in discussion of game design, I think it’s healthy for people to start focusing on its limitations. Once you start making charts and graphs of people’s emotions, it should be obvious you’re simplifying things. And there are going to be contexts where it’s not a useful model. 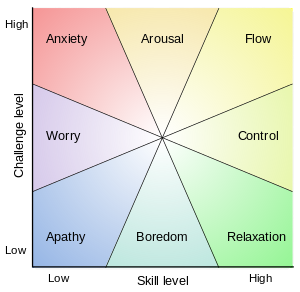 Flow may be more important for some genres of game than others. Or as Polansky’s article says, it’s good at achieving a certain “desired affective experience” but there are other experiences that are worthwhile and might be more desirable, in some cases. Bogost’s article, he argues the virtues of making games that emphasize the systems rather than a character the player is supposed to identify as. He has also defined what he called ‘procedural rhetoric” as rhetoric that is uniquely achievable through games. Soviet montage theory proposed that the one element of film unique to film was the edit. Acting is shared with theatre. Visual composition is shared with painting or photography. The story is shared with theatre or with novels. And that is a useful lens to examine film through, but it doesn’t mean there’s no value to be found in these other elements. For any lens, you need to be open to the exceptions. Maybe you can have meta-lenses that help decide when to make an exception, but sometimes you just have to go by your gut. This entry was posted in uncategorized and tagged game design, video games. Bookmark the permalink.